Last Saturday, I had planned to meet Jodi for a day of thrifting. Sadly, we weren't able to meet up. Instead of moping around because I didn't get to see her, I took the advice of a Twitter friend, Rebecca and visited the Sacramento Modern Quilt Guild. 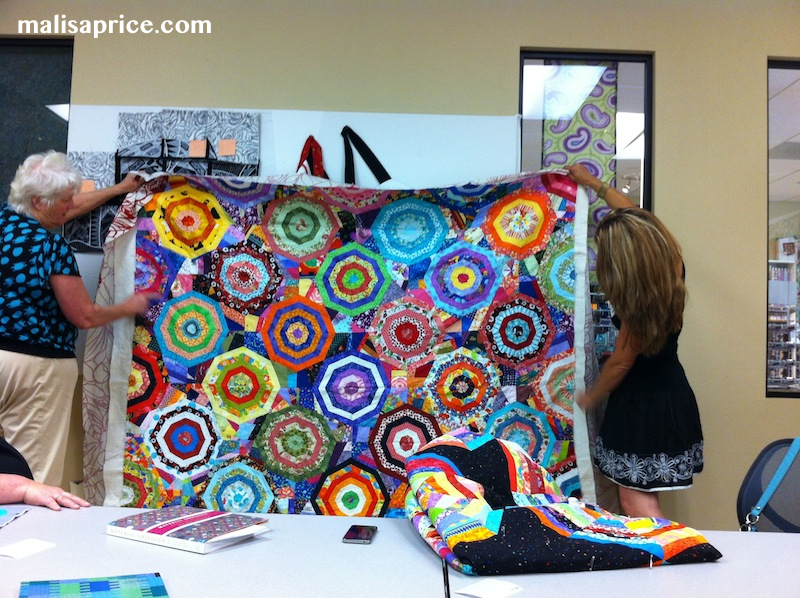 The Sacramento Modern Quilt Guild (SMQG) meets once a month. Every other meeting is at Sew Fun Fabrics in Folsom. The other months they are a "travelling" group. I learned that quilters are often travellers and will drive great distances to find good quilt shops! Upon Rebecca's request, I live-tweeted the meeting. I have never tweeted anything live before and I gained a HUGE respect for anyone that can do so. People talk a lot faster than I can compose a tweet! The SMQG is led by Jenniffier and they are in the process of becoming a more formal group. The meeting was a lot of fun. My personal favorite part was the show and tell. During this part of the meeting, each lady got to show what they had been working on. I was in awe and shock, truthfully, when I saw all of the projects the members had created. Their creations are amazing. Jenniffier showed her embroidery 101 blocks and of course I loved the block with the pennant! The SMQG is working on a Bubble Quilt and Debbie showed her block. She had a few other projects that were incredible. I loved one she's making for "herself" (secret present for a friend) and it's a music-themed quilt. Spider quilt by Nancy. This was actually her "smaller" quilt. I just sat there thinking, smaller?? This is humongous. Golden threads, the quilter's ruler, you sew over the paper and then take it off. It's great for quilting a pattern on your fabric. Coffee inspired quilt by Nancy. I really liked the colors of this quilt. My favorite thing about Modern Quilting: you don't have to sew straight lines! I really enjoyed the SMQG and hope that I'll be able to make more of their meetings. What adventures have you been up to lately?